India’s 2004 tour to Pakistan was a historic one as they were going there for a full series after a very long time. There were huge expectations from the fans back home, who were very eager to see their cricketing stars do well in Pakistan and come back with series wins under their belt. The tour, which included five ODIs and three Tests, began with the one-day series. The first ODI played at Karachi on 13 March was a high-scoring nail-biter that saw almost 700 runs scored and India triumph by five runs. This set the tone for the rest of the series where each match saw crowds flock to the grounds in anticipation of more such close contests. Pakistan came back strongly in the series and won the second and third games to take a 2-1 lead in the five-match series. The action now shifted to Lahore for the 4th ODI where India had to win to level the series at 2-2 against a red-hot Pakistan side. Let’s take a look at some of the best moments from this game that took place on this date. Pakistan batted first after their skipper Inzamam won the toss. 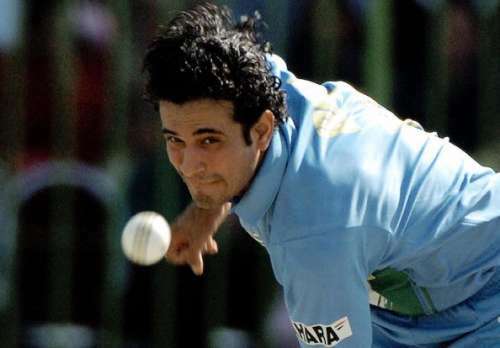 Teenage sensation Irfan Pathan sent the dangerous and crowd-favourite Shahid Afridi back early in just the third over of the innings, having him caught by Yuvraj Singh with the score reading just 8 runs. He struck again in the 9th over of the innings to dismiss the classy Yousuf Youhana for only 9, catching him plumb in front of the stumps with Pakistan’s score at 39. Inzamam then joined opener Yasir Hameed to try and resurrect the innings and put together a 50-run stand, but Indian left-arm spinner Murali Kartik dismissed Hameed for 45 in the 21st over to reduce Pakistan to 89 for 3.